Styrene Butadiene (SB) Latex Market size was more than USD 7 billion in 2016 and will witness 3.5% CAGR during the projected timespan. Rising demand for paper and steadily growing carpet industry will play a crucial role in accelerating styrene butadiene latex market size over the forecast duration. Paper industry is a key end-user, hence technological advancements in paper industry will drive product demand over the next few years. The total paper and paperboard production was approximately 407.6 million tons in 2015 which was a significant rise from 370.5 million tons in 2009. In 2014, according to Pulp and Paper International, China was the biggest producer and consumer for paper, amounting to 1 million tons of paper production and consumption. The paper industry is poised to expand at significant rate over the forecast timespan. Asia Pacific and Latin America having huge growth potential in paper industry and similarly for the industry growth. Carpet industry is an important end-user in styrene butadiene latex market. The carpet industry is likely to witness tremendous growth over the forecast timeframe. China, Japan and the U.S. are major carpet producers and account for more than 40% of total carpet production across the globe. Adhesives industry is a key user of styrene butadiene market. Asia Pacific led the global adhesives production in 2014, with production capacity of approximately 8 million tons and will subsequently propel the SB latex market size. The only major challenge for styrene butadiene latex market is the constant fluctuation in raw material prices, which lead to instability in SB latex production. Raw materials in the industry includes butadiene, styrene, emulsifier and water. Both styrene and butadiene are downstream derivatives of crude oil. For instance, OMNOVA Solutions increased price of USD 0.12 per dry pound on SB latex for carpet and related industries due to escalation in raw material costs. This will directly affect business growth in the next few years. 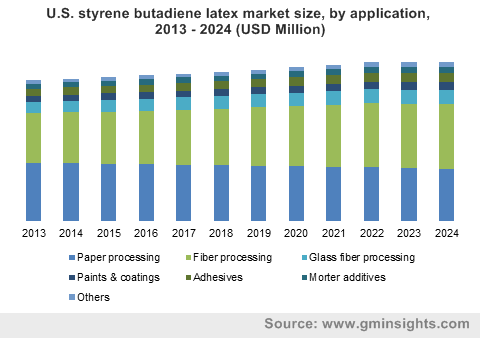 However, R&D initiatives by market share contributors to produce styrene butadiene latex through different methods, will positively influence product demand during the forecast timespan. According to butadiene content in SB latex, the market can be segmented into low, medium and high. Low butadiene content SB latex was widely used across all major application such as impregnation, pressure sensitive adhesives, bonding adhesives, mortar additive and non-woven fabrics. High butadiene content has specific applications as these have high adhesion and are soft type. These are extensively used in adhesives especially in pressure sensitive adhesion applications. Paper processing was largest application of SB latex market in 2016 in terms of volume & revenue. Various types of latexes are widely used as binders in paper coating. SB latex particles bond pigment particles and adhere them to base sheets, affecting coating formulation rheology, coated paper properties and printability. The paper coating market has a huge demand from printing and packaging application. Applications of coated paper range from magazine paper to packaging of containers for food, cosmetics etc Growing demand for paper has increased production levels, especially in Asia Pacific and Latin America, which in turn, has propelled market size. The technological developments in paper industry regarding machines, equipment, materials and formulations shall directly influence the styrene butadiene latex demand over the forecast period. Carpets and adhesives are two important application segments of styrene butadiene latex market which have huge market opportunities over the next few years. Carpets are made from fibers, which use styrene butadiene latex in its processing to enhance its durability and strength. Tufted carpets are popular types of carpet in the U.S. These tufted carpets are back coated with styrene butadiene latex which holds the tufts in place, which results in improved stability and reduced fraying at the edges. 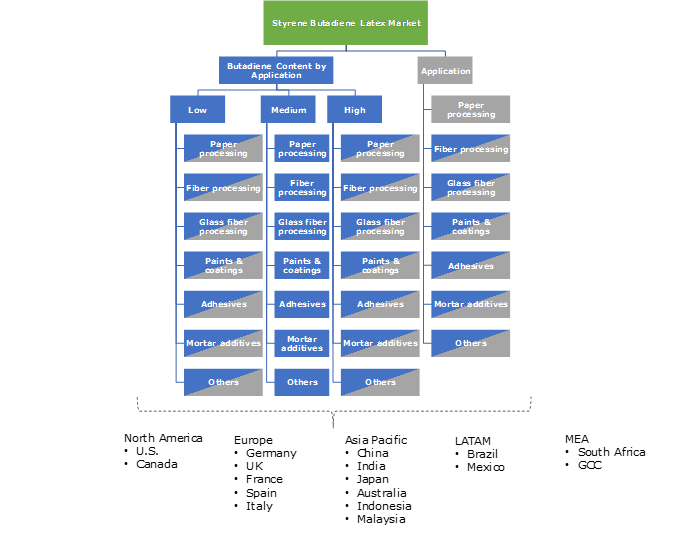 In 2016, Asia Pacific held a major share in the global styrene butadiene latex market size, in terms revenue and volume. China was the largest producer and consumer for paper in 2016, which eventually makes it an important contributor in production of global styrene butadiene latex industry. Continuously growing demand for paper with constant technological changes in carpet industry will complement business growth. Europe followed Asia Pacific in terms of volume in global SB latex market. It shall witness moderate growth rate owing to mature paper industry. Latin America is poised to witness significant growth rate in the coming years due to growing economies including Mexico, which have created huge demand for paper and paperboard materials, which has positively influenced styrene butadiene latex demand in recent times. Global styrene butadiene latex market was competitive in 2016 with two major players accounting for roughly 30% of the industry share. Key players operating in the business are Trinseo, BASF SE, Zeon, OMNOVA Solutions, Styron and The Dow Chemical Company. The market players have multinational presence with an extensive distribution network and years of experience in market. Companies operating in styrene butadiene latex market have various kinds of business structures. This market has also witnessed different patents which have contributed and thus prominently changed the technology and approach in manufacturing process. For instance, a patent published in 2008, addresses the process for preparation of styrene butadiene copolymers using aqueous emulsion polymerization technology. Styrene butadiene latex is a common type of styrene butadiene emulsion polymer and it is completely different from natural latex. SB latex has unconventional properties that makes it unique and different from synthetic rubber, such as high crosslink density, which gives it more toughness and strength compared to others. The product is extensively used in paper coating and back coating on textiles along with application as additive in adhesives and paints. Companies are investing in technologies to increase the product usage in unexplored industries.